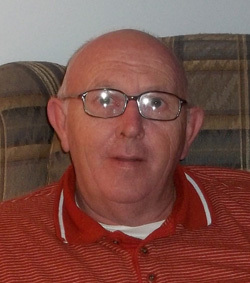 Obituary for Russell Carter Ivey | W. J. Dooley Funeral Service Ltd. It is with great sadness that we announce the passing of Russell Carter Ivey, age 70, beloved husband, father, brother, uncle and friend, on Monday January 14, 2019, at the Northside General Hospital. Born in North Sydney, November 30, 1948, Russell was the son of the late Russell and Mae (MacDonald) Ivey. Russell had a career as a police officer for over 40 years, first with the North Sydney Police Department, attaining the rank of Staff Sargent and later with Cape Breton Regional Police until his retirement. In earlier years he enjoyed coaching with North Sydney Minor Hockey and being an umpire with North Sydney Minor Baseball. Most of all he was a family man who enjoyed spending time with his wife Liz and his two boys. Russell is survived by his wife Liz (MacKinnon) Ivey, his two sons Jason (Dayna) and Carter, both of Edmonton, Alberta, by his sisters Heather (Benjie) Young, Lynn Dominey, Peggy (Robert) Duplain, brothers Bud (Mary), Stan (Theresa) and Ron (Marion) MacNeil, also by sister-in-law Ruth Ivey and a number of nieces and nephews. Besides his parents, Russell was predeceased by a brother Harold Ivey. The family would like to thank Dr. Michel McKeough and Louise McKeough, special niece Ann Marie Penny and the staff of Miners Memorial Manor for the excellent care given to Russell during the past few years. Visitation for Russell will be held 2-4 and 7-9 p.m. Saturday January 19th in the W.J. Dooley Funeral Home, 107 Pleasant Street, North Sydney. No funeral service will be held. Memorial donations may be made to the Alzheimer Society of Nova Scotia. Online condolences may be sent to the family at www.wjdooley.com .